Many families are buried under debt due to medical expenses and cannot afford to put gifts under the tree. Every year Here to Serve adopts out families to volunteers who want to make holiday wishes come true! You can either adopt an entire family and have a group of friends, your extended family or office group or department buy the gifts or you can adopt a single member of a large family. 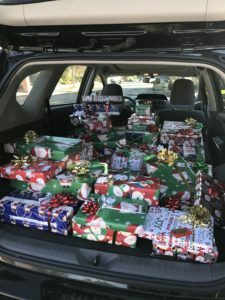 Here to Serve provides a gift wish list (including sizes and color preferences) for the entire family (mom and dad included) and we ask that a minimum of $125 to $150 be spent on each family member. In collaboration with Bel-Air Presbyterian Church, Here to Serve delivers all the fixings for a Thanksgiving meal to our families throughout the 5 counties in and around Los Angeles. 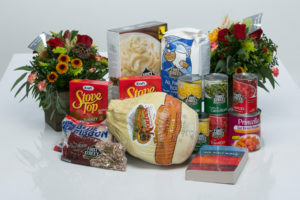 This year our assemble-and-delivery date for Thanksgiving Meal Baskets will be Sunday, November 24th, 2019. If you would like to help either assemble or deliver our Thanksgiving Meal Baskets, please email [email protected] no later than Monday, November 5th, 2019 with your contact information.